Of course, this entire time, you’ve been asking for one article in particular – the one you’re reading right now. Who are my top draft-day targets? Who are my most-owned players this season? Here they are, “my guys” for the 2018 season. Alex Smith (QB21) is another obvious value after finishing third in fantasy points per game last year. The trade to Washington might not also be as damaging as many expect. Over the past five seasons, Jay Gruden’s starting quarterback has ranked fifth, fifth, 10th, 32nd, and third in total fantasy points (there was a lot of turnover at the quarterback position in 2014). Jameis Winston (ADP QB22 and falling) appears to be a great value, despite the three-game suspension. Last year, Winston averaged 306.9 yards per game in games he played on at least 50 percent of his team’s snaps. For perspective, 306.9 yards per game would have led the position last year by 20.8. During those weeks, he averaged 19.9 fantasy points per game, or what would have ranked fourth-best among all quarterbacks with as many qualifying games. Winston is worth pairing with Tyrod Taylor (QB27) who should cover you during those suspension weeks and Tampa Bay’s bye (Week 5) and has upside to be an every-week starter for as long as he can hold off rookie Baker Mayfield. Taylor ranks 11th among quarterbacks in fantasy points per game over the past three seasons – on a conservative run-first Buffalo offense with a lesser receiving corps than the one he has now in Cleveland. Blake Bortles (QB23) also deserves consideration after finishing 13th, eighth, and third in fantasy points over the past three seasons. Other quarterbacks (typically if they’ve fallen a round or more based on ADP): Cam Newton (QB7), Andrew Luck (QB9), Ben Roethlisberger (QB14). 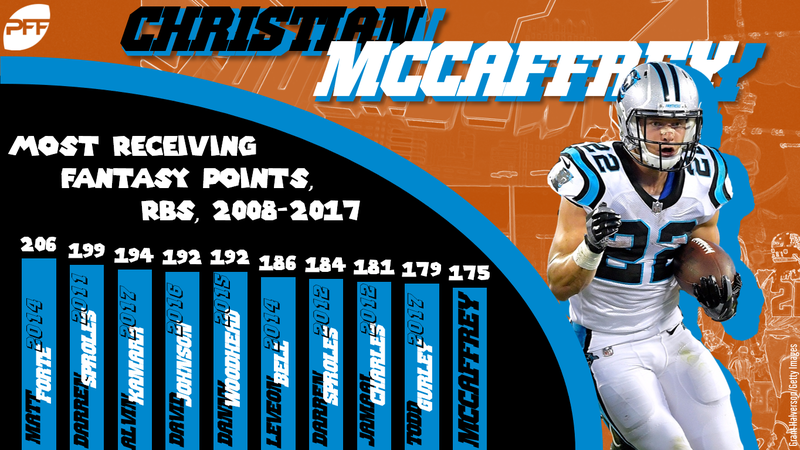 Last season McCaffrey totaled 175.1 receiving fantasy points, the 10th-most by any running back this past decade and what would have been the 29th-most among all wide receivers last year. As impressive as that was, he underwhelmed as a runner. His 3.7 yards-per-carry average — while still better than the efficiency of Le’Veon Bell (3.5) and LaDainian Tomlinson (3.6) in their rookie years, and though his yards-per-carry average looked much better relative to blocking advantage and to the efficiency of Jonathan Stewart (3.4) — was at least a disappointment relative to expectations coming out of college. McCaffrey was one of PFF’s six highest-graded runners in each of his last two seasons in college and totaled 6.1 yards per carry over that stretch. He was a do-it-all bell cow in college, and Carolina coaches appear set on using McCaffrey in a similar capacity this season. Head coach Ron Rivera said in June he sees no reason why McCaffrey can’t reach 200 carries in 2018 . In July, Rivera said getting McCaffrey the ball 25-30 times per game would “be ideal.” In August, OC Norv Turner agreed that number was realistic. For perspective, McCaffrey totaled just 117 carries and averaged only 12.3 touches per game last season. As it stands, McCaffrey is priced at just about his floor – RB12, after finishing RB13 in fantasy points per game last year. Given the likelihood of a larger workload and better efficiency, he’s a glaring value with league-winning upside. Ingram saw a decline in workload toward the tail end of last season and is now suspended for the first four weeks of the season. That’s all true, but he also ranked seventh in fantasy points per game last year and 10th the year before, well below his current ADP, and, sometimes it really is just that simple. As far as mid-round targets go, Burkhead is easily my favorite, mostly because he has no business being drafted in this range. Yes, the New England Patriots spent a first-round pick on running back Sony Michel, but they also lost Dion Lewis to the Titans. Laurence Maroney (in 2006) was the last running back Bill Belichick selected in the first round, but Maroney ranked second among the running backs on his team in carries and targets in his rookie year. Michel will also be sidelined for the majority of camp (and maybe into the regular season), which is never a good sign for a player’s fantasy potential, and especially not for a rookie struggling to learn a new scheme and adjust to NFL competition. Burkhead is No. 1 among the running backs on New England’s depth chart but is routinely being drafted a full round after Michel (5.10 to 6.10). In the final six games Burkhead started and finished last year, he averaged 13.5 expected fantasy points per game and 16.5 actual fantasy points per game. This would have ranked 12th- and 10th-best at the position, respectively, if over a full season. Keep in mind, Lewis (now in Tennessee) was active for all of these games. Other running backs – Jerick McKinnon (RB13), Dion Lewis (RB28), the deep sleepers listed here. 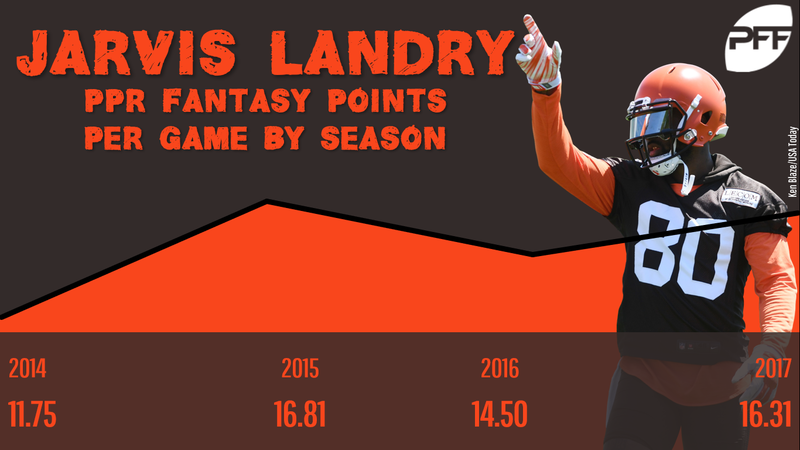 Landry ranks (reading backward) fourth, 13th, and 11th among wide receivers in fantasy points over the past three seasons. So, obviously, his ADP looks odd in comparison. Yes, Landry is now in Cleveland (and they’ve now made him the sixth-highest-paid wide receiver in the league), but Josh Gordon is still missing in action, Corey Coleman is now on Buffalo, and I’m not sure the landing spot is as unideal as drafters are making it out to be. Cleveland ranks seventh (to Miami’s 25th) in passing plays per game over the past two seasons. Either Tyrod Taylor or Baker Mayfield should be a clear upgrade to Jay Cutler. Taylor and Landry have quickly established a strong rapport in camp, and as highlighted here, both Taylor and Mayfield are at their bests when targeting slot wide receivers. Hogan has been one of my favorite values in current drafts, and especially with injury-prone 32-year-old Julian Edelman suspended for four games. If we exclude Hogan’s Week 14 game against Miami last season, which was sandwiched in between seven inactive games, Hogan averaged 13.6 fantasy points per game last season. This is only 0.1 fantasy points per game behind Brandin Cooks, who ranked 18th in fantasy points per game. Hogan would then return in time for the postseason and outscore Cooks by 3.6 fantasy points per game during those games. Add Danny Amendola’s departure and the fact that New England wide receivers have the league’s softest schedule this year, and Hogan looks like a glaring value. Garcon ranked fifth among wide receivers in targets (61) before a season-ending neck injury suffered in Week 8. His volume wasn’t as good as his production (22nd among wide receivers in total fantasy points) but still well above his ADP. He also played much better than his efficiency suggests, grading out 19th-best as a receiver last year (after ranking eighth-best in 2016). This implies Garcon’s efficiency woes were more due to poor quarterback play than his own, and that shouldn’t be as much of a problem next year with Jimmy Garoppolo under center. Over the last three seasons, Sanders has ranked 29th (2017), 10th, and 17th in expected fantasy points per game. Over the same span he’s ranked 51st, 20th, and 16th in actual fantasy points per game. All of this despite the fact that Denver has ranked second-worst in team passer rating over this stretch. Still, his 2017 season looks poor. What went wrong? Mainly, he played hurt for the majority of the year. Sanders dealt with a nagging knee injury that started in Week 7 and would end with Sanders on the injury report in Week 17. In total, he missed four games and spent an additional four weeks on the injury report listed as questionable. Sanders ranked 23rd averaging 12.7 fantasy points per game across his first five games (before ever finding his way onto the injury report), and then averaged only 7.3 fantasy points per game across his final seven games. I’d bet on Sanders making a strong comeback this season. After years of fantasy irrelevance in Buffalo, Woods took a massive step forward in Los Angeles. Woods graded out as our No. 15 wide receiver last year, after ranking 55th of 97 qualifying in the previous season. He also ranked 17th in fantasy points per game (13.8). Or, over his last 11 games (including postseason), he averaged 16.1 fantasy points per game, which would have ranked eighth-most if over a full season. As a bonus, he was also our seventh-most-consistent fantasy player last year (by usage). Unless you think the difference between Sammy Watkins and Brandin Cooks is worth a demotion from the WR2 range to the WR4 range — which I don’t — Woods is another easy value. Other wide receivers – Demaryius Thomas (WR17), Randall Cobb (WR34), Marquise Goodwin (WR39), the deep sleepers listed here. You can read the full argument here, but essentially, Reed offers unrivaled upside when he’s fully healthy and on the field. His fantasy point-per game average when playing on 30 or more snaps is 17.7, which is more than Rob Gronkowski (or any other tight end) and about what a mid-range fantasy WR1 would score. Reed reportedly feels “100 times better” now than he did last year. The quarterback change (from Kirk Cousins to Alex Smith) isn’t a concern for me, considering, of 44 qualifying quarterbacks this past decade, only Tony Romo (25.8 percent) targeted tight ends more frequently than Smith’s 25.2 percent. There’s also enough value at the position in the later rounds (including Vernon Davis as a handcuff) to cover your downside (injury risk). As it stands, Reed is easily my highest-owned tight end in drafts and I’m always disappointed if I leave a draft without acquiring him. Other tight ends: Rob Gronkowski (TE1), Zach Ertz (TE3), the deep sleepers listed here.